Slater's has expanded the burger franchise to 10 units with a 4 unit deal in Dallas, Texas, a 3 unit deal in Las Vegas, Nevada and one new unit in Temecula, California. The Slater's model offers premium quality burgers in a fun, upbeat and mouth watering environment. From creating the original 50/50 patty – made of 50% ground bacon and 50% ground beef – to our menu of over-the-top food favorites and extensive selection of local and regional craft beers. Beverly Hills, CA, November 01, 2017 --(PR.com)-- The nationally recognized burger brand has reached a milestone of 10 locations sold. 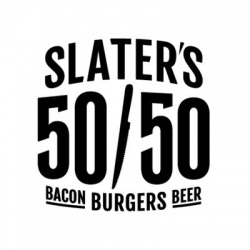 Starting from a dream that bacon should be more involved in the burger process, Scott Slater opened his first Slaters 50/50 in 2009 and Mr. Michael Nakleh in 2017. The burger franchise is proud to announce that the unit franchise has seen tremendous growth in the recent months. New locations are popping up in several places and now you’ll find Slaters in areas such as Dallas, Texas, Las Vegas, Nevada, San Diego, Pasadena, and Huntington Beach, California. This amazing franchise opportunity offers a unique item that draws in the crowds with mouthwatering menu offerings and an award winning customer experience. The main attraction are the Burgers that are made of half ground bacon and half ground beef are a unique treat that hundreds seek out every day. This award-winning franchise offers a great model to follow that is proven to work and offers something for every taste imaginable. Slaters is proud that several new units are joining the family and bringing the Slater's brand to Las Vegas and Dallas which are completely new markets for the brand. The Franchisor offers support, training, marketing, and location selection assistance to each franchisee to duplicate the model efficiently and effectively. What has been exceptionally positive about the Slater's franchise brand is the positive response that each market has shown when a Slater's location opens, people just love the brand and experience. The atmosphere Slater's offers is interactive, focused on service and premium food quality. A customer chooses from the many burgers, craft beers and kids menu making it fun for the whole family. The menu offers burgers that were designed by Slaters or the customer can design one on their own, there are literally selections for everyone. Slater's has some trademark menu items such as the Hawaiian burger, the Peanut Butter or Jealousy burger, some of which are award winning menu items. Slaters 50/50 offers space for luncheons, events, and serves up a mean brunch to draw the crowd in for an early burger delight. Happy Hours at Slaters are opportunities to celebrate a great day on the job, that big sale or just making it through a stressful week. Choose from the many craft beers that are on tap and enjoy the light and fun atmosphere that Slaters 50/50 always provides. About Slaters 50/50 – Good food and amazing craft beer is the simple but effective formula which Slaters 50/50 was founded. Scott Slater founded the first Slater’s in 2009 combining his love for amazing food and the fact that bacon is pure “meat candy.” He created the first burger that was 50% ground beef and 50% ground bacon and from there the rest is history. You can try out one of these award-winning burgers, beers or other selections they offer at any of the new Slaters 50/50 locations.